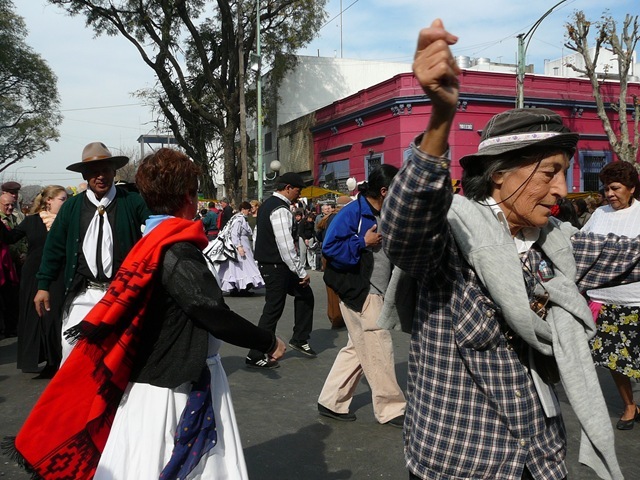 On Sunday we headed out on the local bus to the Feria de Matadores. Here, it is abundantly clear that beef rules the roost in Argentina. 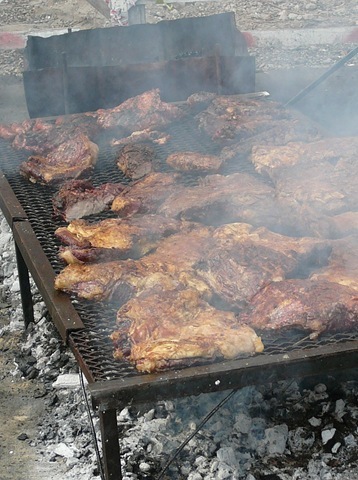 Asados lined the streets and their woodsy, beefy smoke hung in the air. Every one of them had beef and sausages piled high on the grill, and every one of them had a lineup of people waiting to get their fix. I saw people with plates of beef as big as their heads…and they ate it all!! Crazy. There were countless artisan stalls selling jewelry, mate cups and, of course, leather goods – something has to be done with the rest of the cow after all the beef is eaten! On the stage in the center of it all, musicians played and sang while the crowd danced and whirled away the afternoon. Towards the end of the day was the ‘Carrera de Sortija’ or ‘Race for the Ring’. 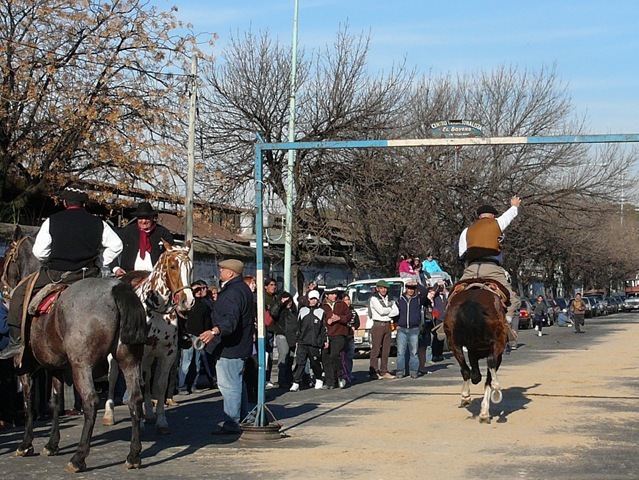 The crowd lined the narrow street, leaving a lane for horse and rider down the center. Halfway down, crossing the road, was a metal frame from which a ring was suspended – the ring being no bigger than an inch in diameter. The gaucho rides his horse down the lane at top speed, stands in his saddle and attempts to spear the ring with a small wooden lance. More often than not they were successful, the crowd would cheer and the gaucho would parade back victoriously. It was quite the sight. 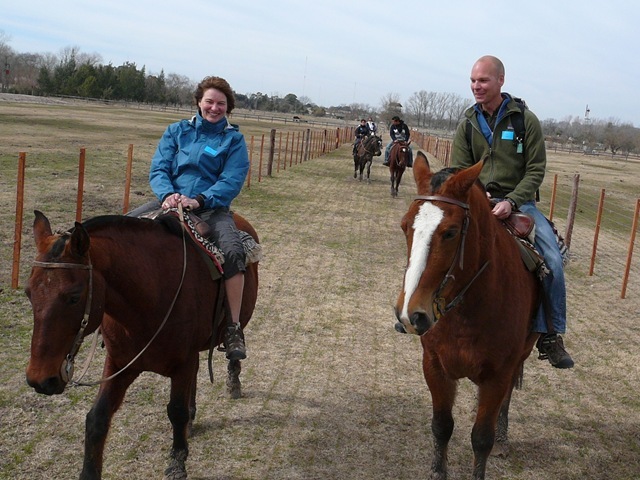 Yesterday we took a trip out to an estancia to get a more rural sense of the pampas and gauchos. 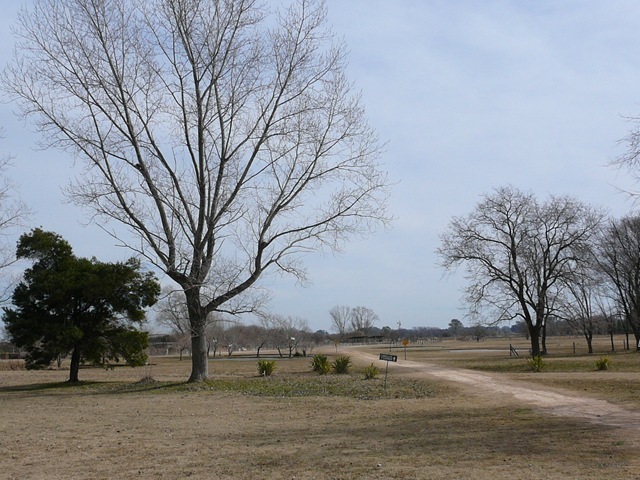 It was, essentially, a dude ranch, and a very quiet one at that as we are definitely in low season. There were 12 of us on the bus…and 12 of us at the ranch. The ranch was beautiful and the dry, winter conditions added to the feeling of ruralness and the stark, quiet life the gauchos must have led. 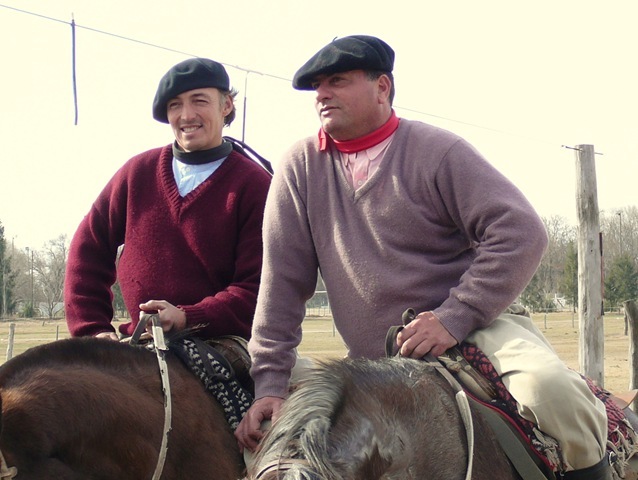 We rode some horses…okay, riding is probably a strong word for what we did…we got on horses and let them lead us around the field, but it did give us an opportunity to watch the gaucho on his horse – what an amazing horseman! Then it was back to the ranch for lunch – beef asado, of course!! Legend says that gauchos ate nothing but beef and mate…I’m not sure about that, wouldn’t they have gotten scurvy? Anyway, they sure still eat a lot of beef – I’ve heard that some tourists go into ‘beef coma’…I think we’re close! Although I think I’m a city-girl at heart, it was fun to get out of the city a little bit to see some of the countryside and meet some of the people that make up its legends. That all sounds great. I’m such a carnivore I would love the street of meat. Pam wants to know where your helmet is and Dean says you could have at least worn a hat to cover up the shine…. where are you living in B.A.? How is it you’re ahead of us already? 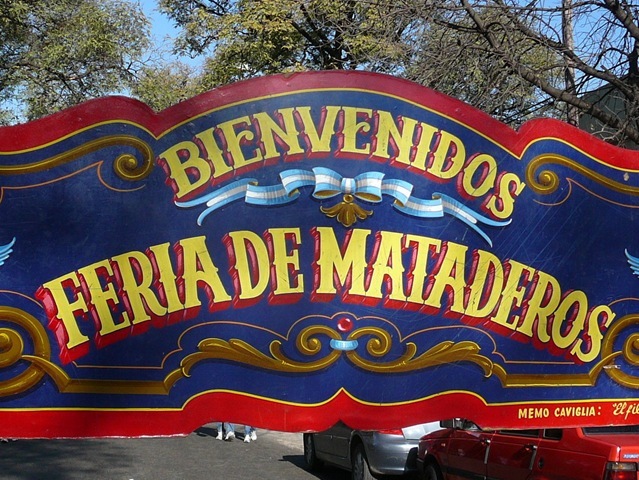 We’ll be in Argentina in about 6 months and cannot wait for some of that savory beef! Thanks for scouting the country for us! !